On the last day of break my family and I tried a new restaurant because my mom had a groupon for it. We went to Bistro 38 Thai Green Cuisine, located in the shopping center with Pole Position on 36th and May. I had no idea what to expect given my family’s history with groupons. The restaurant is small with several intimate tables and booths. The tables can be pushed together for large groups, which is the set up we saw because there was a birthday party going on while we were there. The decor is modern and very well done. I was surprised because it looks like a hole in the wall from outside. Other than the appealing decor, we experienced the offerings of a hole in the wall ethnic restaurant. There was only one waitress for the whole restaurant. It was hard to communicate with her at times because of language barriers, but she answered all our questions. The menu was straightforward and easy to read. I ordered the pad thai with no protein and a medium level of spice. 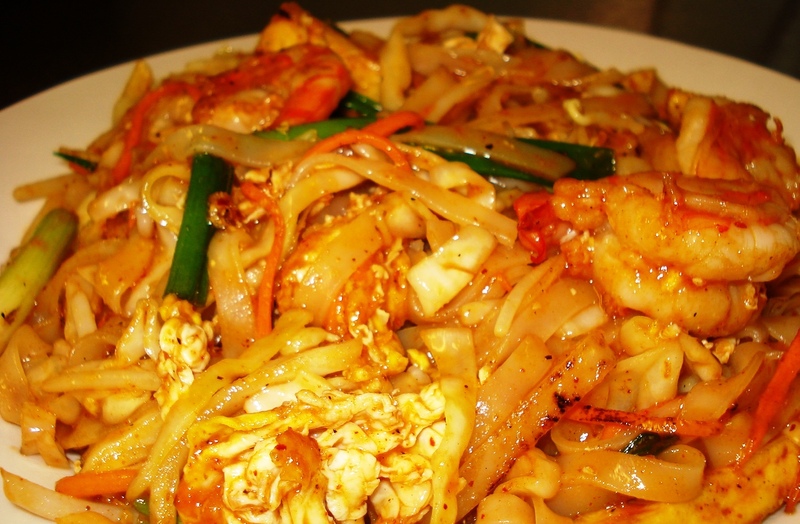 I love pad thai because of the peanut sauce. I compared this level of spice to Sodexo’s mild sauce on Mongolian grill. I wish I had ordered the mild spice because it was too spicy for me. I could not eat very much because my mouth was on fire. I was disappointed by the amount of peanuts on the plate. There was only about one tablespoon of crushed peanuts on my plate. The noodles and vegetables were cooked well. I was impressed by the presentation of the food. The plates were square and the kind I want when I have a set of dishes of my own. My food was arranged intentionally on the plate with the peanuts placed pleasantly next to it. The prices were reasonable based on how much food you get. I took home leftovers, and my pad thai became three meals for me. Each meal on the dinner menu was around $10-12. They have lunch specials daily from $6-9 that seem like a great bargain. I plan to eat at Bistro 38 again but order the mild spice this time. I think the atmosphere is best for small groups around four people. I especially recommend it for dates because the food is fairly authentic, which can make it adventurous, and the atmosphere is perfect for one on one conversations. Check out their website or Facebook for more photos and a complete menu.